HAPPY BIRTHDAY! You are our light. You are our future. Fiat Lux!???? "We do not need the federal government to mandate what already exists: our longstanding, unequivo.. Happy Equinox, everyone! ???? (Stay dry today, Bears! ??) (#BerkeleyPOV by sahilharia1992 on I..
“With neurodegenerative diseases of the retina, often all people try to do is halt or slow furth..
Sather Tower (1914), known to most as the Campanile, is perhaps UC Berkeley's most famous symbol. Visible for miles, it stands 307 feet tall and is the third tallest bell and clock-tower in the world. 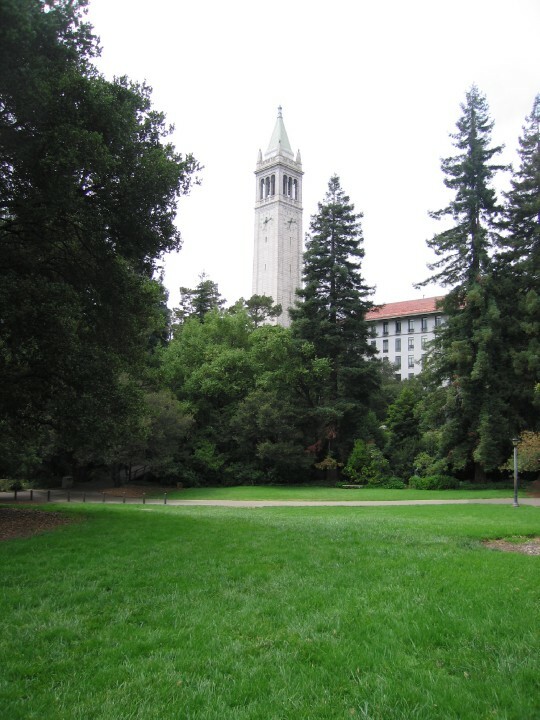 An elevator ride to the observation platform at the 200-foot level provides visitors with a spectacular view of the entire Bay Area and of the campus. Sather Tower, named after campus benefactor Jane Sather, was modeled after the tower that stands in the Piazza San Marco in Venice, Italy. The Campanile houses a 61-bell carillon. There are 38 stairs from the top of the elevator up to the observation platform. Sather Gate (1910) is a famous Berkeley landmark. Until World War II it was the south entrance to campus. It was a gift from Jane Sather in 1913 to immortalize her late husband Peder Sather, a trustee of the College of California, forerunner of the University. Zellerbach Hall (1968) is a 2,000-seat concert hall and theater that hosts the world's best in music and dance, as well as major campus events. The adjoining 500-seat Zellerbach Playhouse is the site of dramatic art, dance and other presentations of the Center for Theater Arts. Zellerbach Hall is the home venue for Cal Performances, the UC Berkeley-based organization considered one of the most influential performing arts presenters in the world. The Bancroft Library includes the Mark Twain Papers and Project, the Regional Oral History Office, The Universtiy of California Archives, the History of Science and Technology Program, the Pictorial Collection, and the Magnes Collection of Jewish Art and Life. It has become one of the largest -- and busiest -- special collections in the United States. Sproul Plaza is the bustling hub of campus, where students meet, musicians perform, and political, religious, and social activists expound, especially at noon during the academic year. At the center of Sproul Plaza is Ludwig's Fountain, named after a favorite dog that spent most of his waking hours in and around the fountain in the 1960s. Located at the entrance to Moffit Undergraduate Library is the Free Speech Movement Cafe, which is open the same hours as the library. The cafe showcases historical documents of Berkeley's famed student movement of the 1960s. The Free Speech Movement was a struggle between students and university administrators over the students' right to advocate for political issues on campus. The 1964 conflict focused national attention on the Berkeley campus and set the stage for anti-war demonstrations across the country. Haas Pavilion (1999) is named for benefactor Walter Haas. It seats 12,000 and contains several large venues for athletic and special events. It replaced Harmon Gymnasium (1933), the site of many exciting basketball games as well as volleyball and gymnastics. Harmon's original facade is preserved and on display inside Haas Pavilion. The adjacent Spieker Aquatic Complex hosts swimming and water polo events, and is home to many nationally-ranked and Olympic athletes. Hearst Greek Theatre (1903) is a 6,500-seat amphitheater set into the hills. The first campus structure designed by campus architect John Galen Howard, the theater was a gift from the late newspaper magnate William Randolph Hearst. Berkeley's Greek Theatre uses the ancient amphitheater at Epidaurus, Greece, as a model, but also includes Roman elements. The UC Berkeley Visitor Center is located in 101 Sproul Hall near the intersection of Bancroft Way and Telegraph Avenue. Public tours are offered daily Monday-Friday at 10am (departing from the Visitors Center; online reservations required). Weekend tours, Saturday (10 am) and Sunday (1 pm) begin at Sather Tower, the clock tower also known as the Campanile, located at the center of campus. California Memorial Stadium (1923) is the home of the California Golden Bears football team. Designed by John Galen Howard, Memorial Stadium is dedicated to students who lost their lives in World War I. Since it opened in the fall of 1923, Memorial Stadium has generated scores of unforgettable memories for generations of Golden Bears. The historic and recently renovated facility is now available for private and corporate events. South Hall (1873) is the oldest building on campus and home to the School of Information (iSchool). Note the bas-relief stalks of wheat at the south and north ends of the building, recalling its original tenants - the University's agriculture laboratories. There are a series of bear statues hidden around campus, and the smallest bear is located over the door to South Hall.